Click the button below to add the Cants Magics by Mompou/LaLena to your wish list. Description: "Cants Magics" is a five movement suite originally written for piano by Catalan composer Federico Mompou. Famous among classical guitarists for his "Suite Compostelana", his piano music is overlooked by many musicians. "Cants Magics" is an early work of Mompou's, and reminiscent of his idea of the "primitivista", the primitive elements of music and art which speaks to our basic human emotions. The absence of bar lines and key signatures, along with his general use of harmony, show the influence of Erik Satie and other french composers such as "Les Six" "(whom he had spent considerable time with while living in Paris). Truly a miniaturist, the longest movement is only about two minutes. Mompou believed in the emotive power of simplicity, and there is truly not one superfluous note. 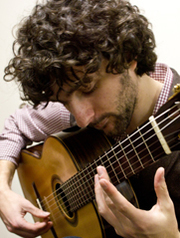 Anthony LaLena began studying the classical guitar on Long Island, New York with guitarist and lutenist, William Zito. He continued his studies at S.U.N.Y. Fredonia with Evan Drummond and James Piorkowski where he received a Bachelors of Music with a Performance Certificate in 2013. In the spring on 2010, Anthony was chosen to take part in an exchange program where he studied under Jose Luis Montesinos at the Conservatorio de Manuel Castillo de Musica in Seville, Spain. He is currently pursuing a Masters of Music at the Manhattan School of Music under the direction of guitarist and composer, Mark Delpriora. Mr. LaLena has participated in masterclasses with internationally recognized artists such as Roland Dyens, Ana Vidovic, Nicholas Goluses, David Starobin, Marcin Dylla and many more. He has performed in Germany, France, Spain and the United States. Mr. LaLena was also a member of the Fredonia Guitar Quartet, an internationally touring ensemble. While Mr. LaLena was a member of the Quartet, they were the dedicatee of a piece by the critically acclaimed guitarist and composer, Roland Dyens. Are there any more Mompou duos comming from LaLena?